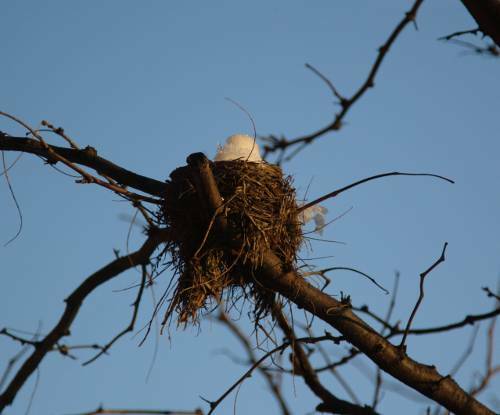 Glancing out of an office window, I did a double-take: a lump of snow in an old robin's nest had taken on the appearance of an icy bird in the light of late-day. Feathers hanging off the right-hand rim of the nest aid the visual trick. I shot the picture through the glass to preserve the angle of view necessary for the illusion. I expect "Frosty the Snowbird" to disappear entirely sometime tomorrow — we expect above-freezing temperatures. Wonderful photo!! Nests are amazingly cool, I love the weaving on that one. Very special. A lot of work goes into making a nest… love the illusion. Isn't it funny how excited we get about a day marginally above freezing? I've seen a few good bird nest field guides and have been tempted to buy them just for the photos.